East London Bicycle Organisation (ELBO) was established in 2011 as part of phase 1 of the BMX Legacy Project. Based in Walthamstow ELBO caters for anyone who wants to have fun on a bike. The club links with schools, clubs and individuals in areas in North, East, South, and West London. Medium sized play track in Cheney Row. Built by Biketrack and opened in August 2012 it features tight, challenging tarmac berms and long straights. 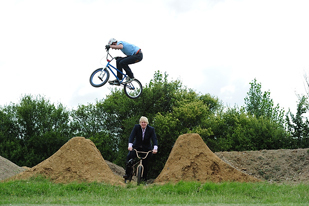 Simon Hall, ELBO Creator jumping Boris Johnson at the Proto-track development.